Lactaid Ice Cream - New Flavors! Both my husband and my son are lactose intolerant. Through the years they have given up enjoying spur of the moment ice cream treats. We have invested lots of money in LACTAID® tablets over time since it has proven to be the most effective with lactose intolerance. During July, which was National Ice Cream Month, LACTAID® Ice Cream introduced two new delicious flavors to their existing line-up so those that suffer from this intolerance can indulge in a creamy scoop of their favorite cold treat, without discomfort! I am embarrassed to admit that until this campaign I didn’t even know LACTAID® made ice cream! I was aware of their other products so didn’t hesitate to jump right into a big bowl of their ice cream! You may have heard of lactose intolerance, but may not know what it really is. Lactose intolerance is characterized by the symptoms that occur when your body does not make enough of a digestive enzyme called lactase to digest a sugar called lactose, which is found mainly in milk and other dairy products. Normally, our body produces lactase, which breaks down lactose into two simple sugars, glucose and galactose. These two sugars can then be absorbed into the bloodstream. People whose bodies don’t make enough lactase can’t fully digest lactose, causing mild to uncomfortable side effects. The Dairy Digestion Test can help you determine if you have a dairy sensitivity that may be caused by lactose. Avoiding dairy based products that cause you discomfort is one way to battle symptoms. Taking a LACTAID® tablet prior to consumption is another and the way both my husband and son dealt with the intolerance for years. Lactaid now makes a wide variety of products that are delicious and that can be used by the entire family including milk and cottage cheese. Of course, my favorite is the LACTAID® Ice Cream! swirls and dark chocolate chips with creamy lactose free ice cream. Savor the delicious flavor with none of the discomfort. LACTAID® Ice Cream is delicious, rich and creamy because it’s made with 100% real milk and cream, without the lactose, so it’s naturally easy to digest. LACTAID® Ice Cream flavors are available at grocery stores and Walmart nationwide for a retail price of $4.49 for one quart. Place baking sheet in freezer. Bring ice cream out of freezer to soften for 2 minutes. Prepare any toppings by placing them in shallow bowls. Working quickly: Lay one cookie top side down on a baking sheet. Using 1/3 cup ice cream scoop, scoop ice cream onto the cookie. 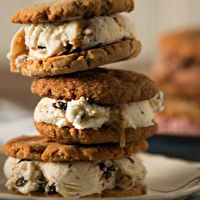 Top with second cookie, pushing down lightly until the ice cream reaches the edges. Roll in desired toppings. Place on baking sheet in the freezer. Repeat. Serve immediately, or wrap individually in plastic wrap for longer-term storage. 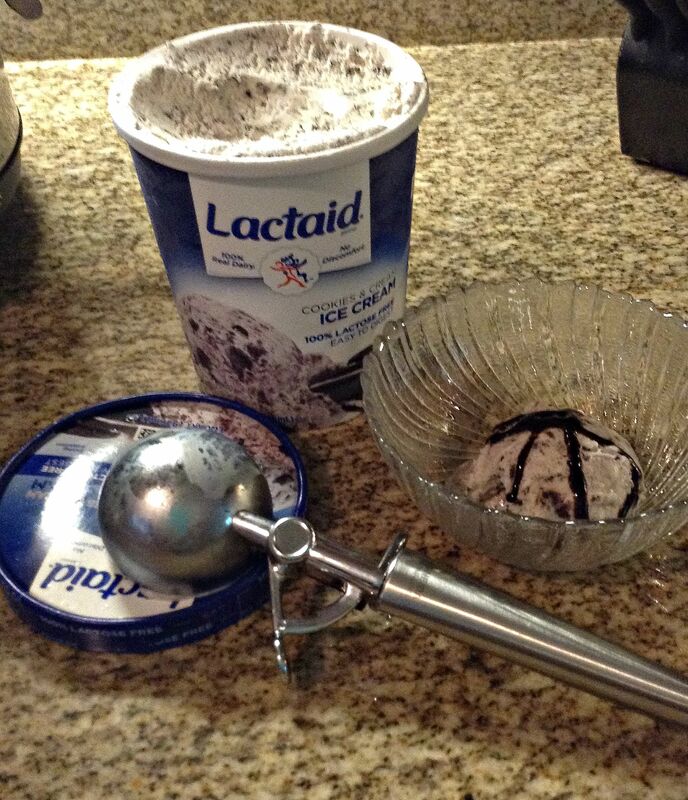 When it comes to LACTAID® Ice Cream, your guests will never know it’s not regular ice cream! Serve it for your next get together and create a topping bar! While the ice cream will be the main attraction, make sure to stock up on some classic toppings, in addition to some trendy ones. Sprinkles and cherries are great, but why not throw in some hot and spicy nuts, crushed waffle cones and fruity cereal for a twist. Music Lovers Rejoice! Sonos One is the Smartest Speaker Around! Hi Gretchen! Unfortunately this post is almost 3 years old so I have no idea what the company has available now. You would have to contact them to find out what they have available.